If you read my blog with any regularity you have probably figured out that my primary OBGYN is not in the town that I live. We have to travel 2 1/2 hours south of where we live to go to a Perinatal Center which specializes in higher risk pregnancies than what my town can do. In the city we go to, there is a mall with a Carousel. 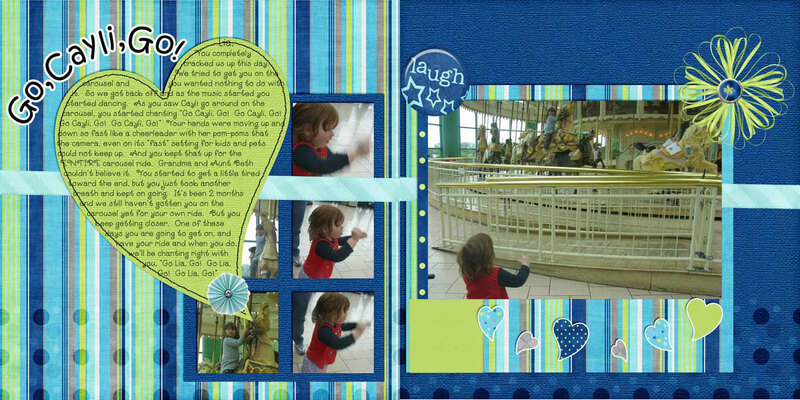 Our older daughter loves the carousel and wants to go on it every time we say we are going there. My youngest daughter says she wants to go on it but as of yet has not gotten past one foot up on the carousel platform. We keep trying though, and the nice people who run it give us back our dollar each time she decides she doesn’t want to ride after all. Well Sweet Tomato Designs recently came out with a new kit in honor of her son Nolan. And although the colors of this kit could be very boyish, I love how they work with my story and my pictures. When the call came out that the kit was ready, I had just gotten my camera back from accidentally leaving it at a friends house over the Independence Day weekend. So as I downloaded pictures, these were right there and just calling to be scrapped. Sweet Tomato Designs also is releasing today a set of templates and when I saw the one, I knew I just had to combine these two releases today into a 2 page layout. Here they are side by side. I love the way this layout came out and I hope as you are looking it you can see the effect of them side by side. In order to purchase either the kit Nolan or the Twofer Template which contains the template I used to create this layout visit Sweet Tomato Designs at Polka Dot Plum.